Custom client-side CSS to change background colours. CSS, greasemonkey, sunglasses? 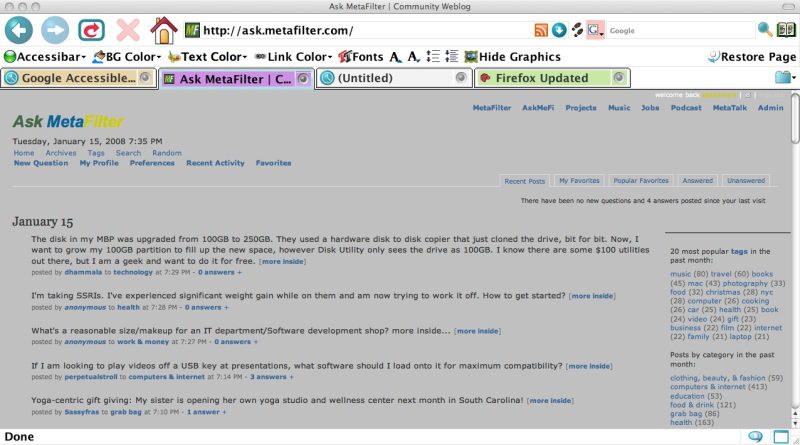 Is there a way to stop white web pages hurting my eyes (firefox, osx). Even on the lowest brightness setting, I find, of an evening, that white-backgrounded web pages are too bright on my macbook. I suspect there's some way for me to have a local CSS file or something that I can turn on and off at will, to just swap white backgrounds for a more muted grey. Or something. Everything I see on google seems to be about blogs, but I want this on the client side. I suppose there could also be a greasemonkey way to do this, but greasemonkey scares me more than CSS. Corey Hart scares me more than both. If you don't want to mess around with css or Greasemonkey you might like to try a program like Nocturne which simply inverts the colours on your screen making it much nicer to look at under certain conditions. one approach for this on OS X is Ctrl+Alt+Apple+8. pressing all those keys at once throws the color scheme to the "negative," which will usually switch white backgrounds to black, then with white text. i just wish there were a way to do this on the PC at work. grrr. Another "not exactly helpful" solution is rgGamma. It's for using your Mac whenever night vision is critical. It shifts the screen gamma so everything turns monochrome red-black (or green-black or your-choice-black). I use it when hacking in the dark. This bookmarklet will (sometimes) work. Doesn't work on mefi though. Drag it to your toolbar and click. It should at least get you started. What you are looking for, I think, is accessibar. It does a ton of things like this, primarily for people with low vision who need high contrast stuff. I *think* you can make it so the only stuff that changes is the BG color, but you can mess with all the fonts through a series of pulldown menus. Easy peasy. Here's a screenshot of the AskMe simple style changed to a grey background. This will, imo, only do it per-site so if you're looking for something that changed all examples of white to grey, this will not help. The Stylish Firefox add on will let you do this by site, although not to every white backgrounded site. If you don't mind switching browsers, Opera does pretty much exactly what you want. There is an option under the View\Style menu which allows you to force one of a series of predefined CSS style sheets upon any unsuspecting website, including two "High Contrast" modes (black on white and white on black) and an "Accessibility Layout" which displays contents in a pleasing black on green colour combination. I think you can also define your own style sheets, but I haven't played with it that much. If you're not totally tied to Firefox, I would recommend giving Opera a try, in any case - it really is a magnificent browser. Obvious point, but try to make your room bright so your pupils don't dilate much.